Global TV And CTV were both on hand to get information of the proposed logging in the Beaver Mines area. Here Global Television reporter, Ashley Hawkins interviews one of the protestors. Waterton townsite: A colorful cake, cupcakes and card for Premier Stelmach reading, “We’ll eat the cake and celebrate when you protect the Castle and stop the logging” highlighted a rally in the wind outside the opening of the first annual international Crown of the Continent Conference in Waterton townsite this morning. 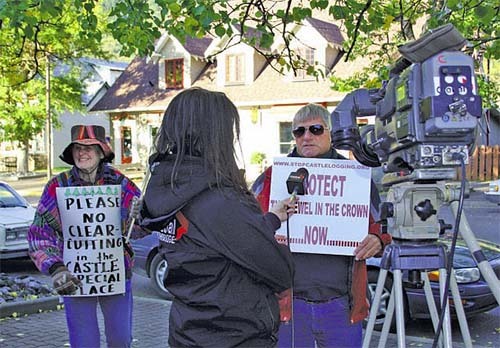 More than a dozen area residents and business representatives with displays and placards wanted to let their MLA, Evan Berger and the 200 conference attendees know that Berger’s and the Sustainable Resource Development Minister’s plans to allow a more than four-hour distant sawmill to clear-cut of the Castle Special Place is unacceptable. Candles for the numbers species living in the Castle that are listed as rare and as Species at Risk of extirpation (extinction within Alberta) adorned the cake and cupcakes: 14 mammals, 44 birds, 145 plants, 3 reptiles, 5 amphibians, 2 fish, 10 butterflies and a number of spiders. The Castle, once part of Waterton Lakes National Park, is part of the future health of the Crown of the Continent ecosystem. “The great outdoors, not two by fours,” reads one placard and “the Jewel of the Crown” another. “We want to let people know that tangible conservation action is needed now by stopping the logging, instead of deferring protection until after a new land use plan is done and the core of is clear-cut.” explains area resident Phil Hazelton to the TV news media present. Inside, Evan Berger who also represents Alberta on the Crown of the Continent round table, gave an opening address to the conference, focusing on inter-jurisdictional cooperation and the province’s regional land-use planning. Through the planning, he offered the potential of future conservation and stewardship. But for today, he made no mention of the logging, which pre-empts the planning or of any new conservation actions on the ground during the interim until new plans are done and implemented. The Castle is an important part of the ecological integrity of the trans-boundary Crown of the Continent ecosystem, including for wildlife habitat of species found part of the time in Waterton Lakes National Park, such as grizzly bears and elk. Public demand for natural areas has for many years exceeded the ecological and social capacity of Waterton Lakes National Park. Alberta’s Sustainable Resource Development Department (SRD), of which MLA Evan Berger is Parliamentary Assistant, has given the Spray Lakes Sawmill located west of Calgary, permission to clear-cut log in the between Beaver Mines Lake, Castle Falls and over Carbondale Hill into Lynx Creek. This is a prime recreational area that includes provincial campgrounds and Scouts Canada’s Camp Impeesa. SRD has identified the whole Castle Special Place as core grizzly bear habitat for the Alberta grizzly bear recovery plan and much of the area slated for logging is zoned Critical Wildlife and General Recreation. 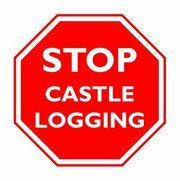 You are currently browsing the Stop Castle Logging blog archives for October, 2010.